Elliott's Psilotrichum is a perennial herb, somewhat woody at the base, creeping and forming mats up to 1.2 m across or scrambling among low vegetation, considerably branched from the base and often also above. It is named for Stephen Elliott, 19th century South Carolina (American) botanist. Stem and branches in the older parts round, striped, finally becoming hairless at the base, quadrangular and grooved when young, densely furnished with long white hairs, not swollen at the nodes. Leaves are ovate to broadly oblong, 1-5 x 0.8-2.75 cm, rounded to shortly tapering at the mucronate tip, rounded, nearly flat to shortly wedge-shaped at the base, nearly stalkless and semi-stem-clasping or with a leaf-stalk up to 5 mm. long, moderately or rarely densely furnished on both surfaces with rather long subappressed white hairs, sometimes becoming hairless above with age. Inflorescences are rather short spikes 6-8 mm. wide and finally elongating to 1.5-3 cm., at branch-ends and generally 2 at each node in the leaf-axils, stalkless or on very slender flower-cluster-stalks up to 3 cm. long; bracts deltoid-ovate, 2-2.5 mm., densely white hairy; bracteoles are broadly heart-shaped-ovate, 1 mm. Flowers are stalkless. 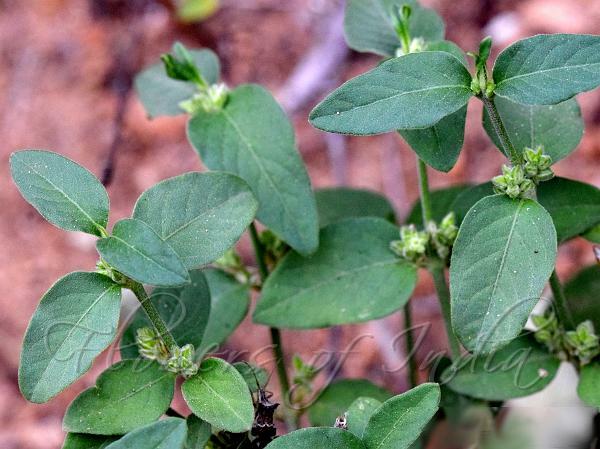 Tepals membranous, strongly 3-ribbed and greenish centrally with broad pale margins; the 2 outer lanceshaped to oblong-lanceshaped, 3-4 mm. The intermediate tepal long-hairy along one margin. Stamens are 1.75 mm., very delicate. Capsule is oblong-ovoid, 1.5 mm. Seed are ovoid, 1 mm., compressed, brown, shining, faintly netveined. 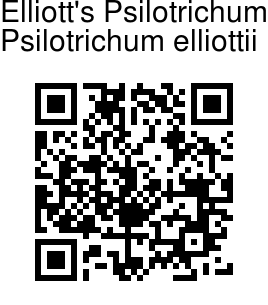 Elliott's Psilotrichum is native to Asia-Tropical and Africa. Medicinal uses: Leaf paste is given to improve eyesight. Identification credit: S. Kasim Photographed in Udumalpet, Tamil Nadu.